During the late summer and fall, you can pick your own apples at a variety of farms and orchards on Long Island. It's a great experience to tromp through an apple orchard, surrounded by trees laden with ripe fruit. Go alone or bring friends and family to fill a bag or bushel basket with apples that are as fresh as can be. 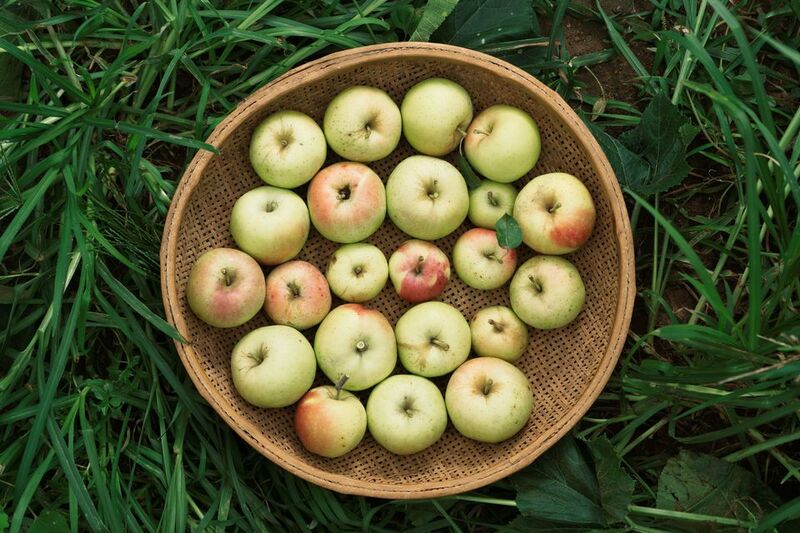 It's a win-win situation: You have a glorious day in the orchard and you bring home a bounty of apples right at their peak, great for eating raw or using in homemade apple pie, apple crisp, applesauce, apple muffins, or apple fritters, among so many other goodies. Here are some places on Long Island where you can pick your own apples. Please note that growing seasons vary, so always call first for picking dates and times at each of these farms or orchards. Filasky Farm in Aquebogue is open throughout the growing season. Pick apples during September and October and peaches, pears, tomatoes, strawberries, raspberries, blackberries, peppers, zucchini, eggplant, and pumpkins at other times of the year. This small farm in Northport features dwarf, 6-foot trees with fruits just 18 inches from the ground. This makes it a perfect size for children and their families to go apple-picking. All the apples at Fort Salonga are pick-your-own, and because the farm is small, it closes temporarily when there are no ripe apples to pick. It's especially important to check with this farm before you head out for an apple-picking adventure. Although best known for its pumpkins, this South Fork venue in Water Mill also features apple-picking on weekends only in September and October and school holidays in those months. You can also pick up hot or cold apple cider, freshly baked pies, cookies, and candied apples at this farm. The first pick-your-own farm on Long Island, Lewin Farms offers pick-your-own apples, strawberries, blueberries, raspberries, blackberries, peaches, tomatoes, corn, pumpkins, and Christmas trees, depending on the season. The apple-picking season stretches from late August to October at Lewin's, in the North Fork's Calverton. If you're not in the mood for picking your own, check out the farm stand, which is open from Memorial Day weekend through late October. Pick your own apples in season at Seven Ponds Orchard in Water Mill. You can choose your favorite from many varieties, like Gingergold, Honeycrisp, Cortland, Fuji, Jonagold, and Delicious. You can also pick your own berries and vegetables in season or buy them at the farmers market. Pick your own apples, peaches or pumpkins, and enjoy apple cider, fresh apples and peach pies in season. You'll find 20 varieties on dwarf trees, perfect for the smallest of apple-pickers. Milk Pail opens on Labor Day weekend and stays open on Fridays, Saturdays, and Sundays through October. You can also pick your own pumpkin and squash when they're in season. Wickham's Fruit Farm in Cutchogue, set against Peconic Bay, has been a farm since 1661, making it one of the oldest continuously cultivated areas in the United States. And it's still family-run. Of the farm's 300 acres, about 200 are planted as fruit orchards. Pick apples at Wickham's during October and strawberries, raspberries, blueberries, cherries, and peaches during their respective seasons.